Several months ago a dear friend called needing some encouragement. As I walked through God’s promises of who He is, they told me that I needed to put it down in a blog post both so others could read it and so I didn’t have spend an hour on the phone with each person reciting it. As with most things it went on my “to-do” list. My very, very long to-do list. Until this morning, when one crushing disappointment after another came at a breakneck clip and I needed to sit down and remind myself of these truths. So, for those of you struggling in the wilderness, carrying more then you want to (or ever imagined you could), for those of you living through things you spent your whole life hoping (or working!) to avoid, these next 3 blog posts are specifically tailored for you. Today’s centers on who God is. And a quick note… if life is grand, read these anyway. You can use them to encourage others in your day and trust me, some day you too will need them. Because before you can trust in God, you need to know who He is. Merciful. (Psalm 86:5, Ephesians 2:4, John 3:16) The definition of Mercy is the withholding of punishment when it is within ones right or power to punish. If that’s not one of the clearest descriptions of God’s love to us in Christ, I don’t know what is. By our sins we have alienated ourselves from God and are deserving of punishment. Think about when your kids deliberately misbehave for the 4th time that hour. Not only do they deserve to be punished, any future harmony or authority you hope for requires that they be punished. Yet God, in His infinite mercy, when we were dead in our sins, instead of making an end of us, sent His Son for us. God is Merciful. And whatever it is in your life where you think you’re being punished or stoically standing there in the face of judgment, never forget that we serve a God who reached into our sin-filled world to offer mercy at the point where we were most deserving of punishment. It’s not what He does. It is who He is. Loving. (Romans 5:8, Psalm 86:15, 1 John 3:1, Proverbs 8:17) We have all heard the verse quotes God is Love, right? 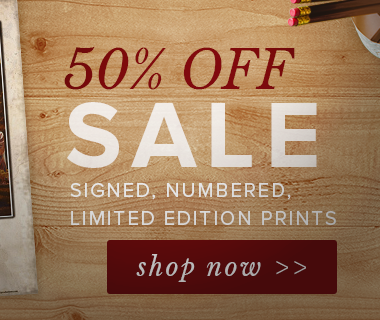 While a powerful truth, we quote it in such a way that makes God sound like a Hallmark card. The truth is that you can be strong and not show strength. You can be the smartest man alive and get a Jeopardy question wrong. God is love, but it doesn’t stop there; He is loving toward all He has made. He is not merely love, but He extends love, gives love, to His children. And yes, we know the truth that He has demonstrated that love powerfully and without compare on the cross, but do you know that He loves you right now, where you are? One of the most precious promises is in Romans (we all know it) where Paul writes that nothing – not height nor depth, nor principalities or powers – shall be able to separate us from the love of God. And I might add: Failure, Screw Up, Accident, Mistake or Boneheaded Move either. So many people I’ve counseled who have failed spiritually, gotten divorced, committed a crime, had an affair, screwed up big, etc think God is up there waiting to squash them or that they have somehow run further then He can (or is willing to) reach. Is that you? The truth is that while those things displease God, and He waits for our repentance, it does not even for one second change His love for you. There may be consequences, but never a lack of love. When your kid screws up and speeds and wraps the family car around a tree, you get mad, you get disappointed, but do you ever, for even one millisecond stop loving him? If you do, it’s not love. Love never changes. Love never finds fault. Love always thinks the best. (1 Cor 13). And God is love. And He is loving…. Toward all He has made. Toward you, even now. Good. (Psalm 100:5, Psalm 145:9, Matthew 19:16-17) What is your response if I said God is good? If you were raised in certain denominations it is a rote “All the time” or “All the time God is good”. But the truth of it is that God defines goodness. He defines what is truly good. And all He does is good. 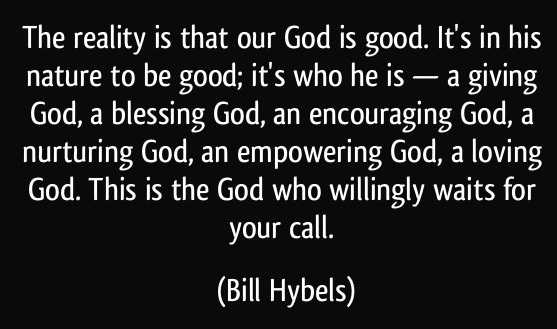 It’s not, as this great quote from Pastor Bill Hybles says, that God does good, it’s that good defines Him, it is who He is. Period. So, can God do evil? That would be a direct contradiction to his nature. Why then do bad things happen? We’ll touch on that in a few sentences. But one of our primary controversy with God centers on the fact that we really don’t believe that God is good, that He has His best in store for us. We act like instead that we have to somehow protect ourselves from God. If God is good (He is) and if He is perfect (also true, see next section) and if He is in control (yep) then what He does in our lives is right, no matter the pain. Telling God He is not good because of how it feels would be like telling a surgeon he needs to remove the tumor but can’t cut you open. It doesn’t work that way. I remember once as a new dad needing to bring my son to the doctor because he was rocking a 105 degree fever. Of course there was a shot. And of course it hurt. And of course he cried. So I must be a bad dad. Right? But think of the standard we hold God to… if it hurts it must be bad! And we forget, that no matter how it feels, God is good. It’s who He is. Compassionate. (Exodus 34:6-7) We only need one verse reference for this. This truth about who God is comes during His revelation of Himself to Moses. Remember that part of the Bible? Moses goes up to get the 10 Commandments, the Israelites start bowing down to a cow (I mean really, a cow??? Couldn’t they at least pick a lion or something cool?) and as a result, many of the Israelites die. And Moses has to go back up for round 2. But Moses says something profound to God, He says, “If You are really for me, I need to see you. I need to know who You are. I need You to reveal yourself to me.” Ever felt like that? And I think I know what Moses wanted, He wanted a face to face with God in heaven. He wanted a momentary break from the yelling and bickering of millions of discontented exiles. He wanted a moment where what he believed about God was made tangible fact. And what He received instead is a statement about God’s nature. And God led with these words: “The Lord, the compassionate and gracious God”. As the Creator, King of the Earth, as the one who just kicked the snot out of the most mighty military on the face of the earth. As the one who had control over everything, you might think God would have led with a different description. God, the Wise? God the Powerful? God the “if you question me again I am going to dissociate all of the atoms in your body and they won’t even find so much as a fingernail”? No, what He opened with is that His is the “compassionate and gracious God”. That should warm the heart of any of you who are in dire straights. Financially, personally, emotionally, spiritually. Those of who you made a mistake and got sideways, those of you who have made a lifetime of mistakes and wound up in a prison of your own making (literally or figuratively). The fact that you have not (and none of us alive have because it would mean death) received the due penalty you deserve for your sin prove God’s compassion. And more so, like David when he failed, there is still an appeal to be made to the Lord, the compassionate and gracious God. Who deals with us not as our sin or folly deserve but with a compassion for the truth that we are frail and but dust. Surely, God is compassionate and loving to all He has made. That includes you, even now. Perfect. (Deuteronomy 32:4, Matthew 5:48). This is both one of my favorite things to tell people and one of the hardest to digest. By perfection, we don’t merely mean super excellent. We mean without flaw. God has never, not once, made a mistake. He has never, not once, sat back and thought, “Hmmm… wow… shanked that one”. That means whatever plan He has for your life, whatever He says, whatever He has said through His Word is perfectly correct, by definition. Sure, we like to try to wiggle around that last point especially and cults love to say that the Bible is flawed. But don’t you think a perfect, almighty God would make sure we know what He wants to say to us? And the problem we face here is that if God is perfect and I am flawed, then we, on the basis of that realization, need to yield to Him, His timing, His plan, His direction. Which often means things we don’t like or want to do, experience, or go through! Yet if, in those moments we remind ourselves that God is loving and compassionate and perfect, we can rest assured that whatever we are going through is right. Because God never fails, never makes mistakes. Because God is perfect. Gentle. (Psalm 103:10, 2 Corinthians 10:1, Isaiah 40:11) There are so many people that think of God as the Divine Finger in the Sky just waiting to tee up behind them and use said finger to delver a good swift impact that sends them flying. Much like we might do to a speck of trash on the table or an offending bug on our arm. (If that’s you, let me just say in love – that’s not God. That’s your false construct of God and it’s as much an idol as the Israelites’ cow.) The truth evidenced through Scripture is that God is so gentle and loving, dealing with us as a tender parent rather than as a harsh judge. Treating us as His love demands, rather then as our sins deserve. But I think more than any other promise, this is one where we see the evidence clearly displayed both in Scripture and in our own life. Look at David, he blew it time and again, yet God was so gentle with him and corrected him in love, not wrath. Look at how Jesus dealt with Martha when she wanted to argue theology at her brother’s grave. Look at what Jesus said to the thief crucified next to Him. Recall how He restored Peter after he not merely doubted but denied Him publicly. And look at your own life. The just deserts of sin is death. But you’re still drawing breath aren’t you? And there is still a future and hope for you. You still have plans, you still have dreams. All of that is proof of God’s gentleness. A prisoner under sentence has no hope (read Count of Monte Cristo) because gentleness is not a feature of the prison system. But you are a loved child and God is gentle with you. Not punishing you as your sins deserve. Not holding you to an impossible standard but gently leading you – carrying when necessary – while all the time you kick and squirm and cry and tell Him how painful it is. And if He wanted to defend Himself, which He of course need not do, all He would have to show you is what you really deserve and you would fall at His feet in humble thankfulness for His gentleness. 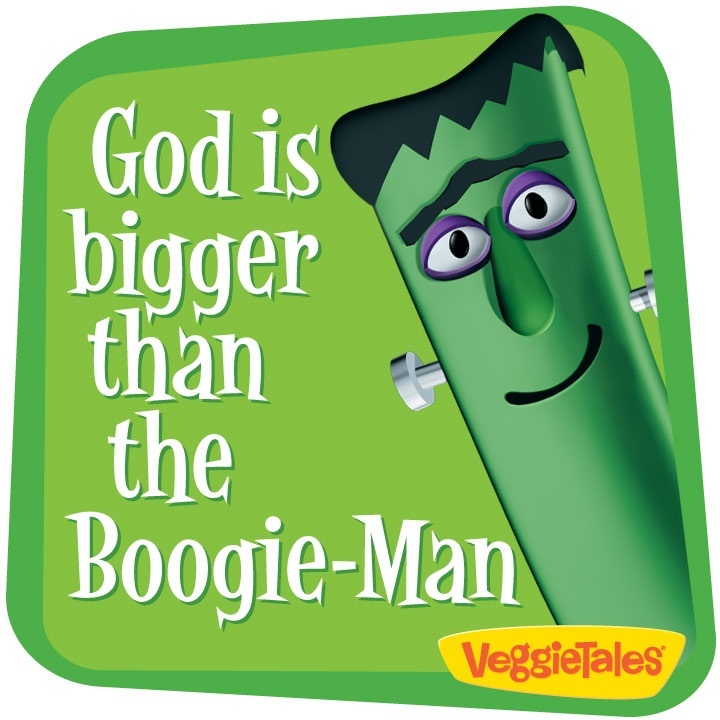 God is bigger than the Boogie Man, He’s bigger than Godzilla or the Monsters on TV! God is bigger than Boogie Man and He’s watching out for you and me!”. That captures a child’s understanding of the greater truth… there is nothing larger, bigger, righter, more powerful than God. There is no one able to thwart His power, check His hand or force Him to do anything. God is above, beyond and past any sort of control. As the line from the C.S. Lewis story goes, “Is he safe? No, not safe, but so good”. There is nothing, no one, no thing which can stand up to God with any hope of even wounding Him. And that God, we have the privilege of being His children. Whatever you’re facing, no matter the obstacles, the forces arrayed against you, the probability of defeat or the improbability of success… God is bigger. Infinitely bigger and more powerful then whatever you face or your need. He is truly, Almighty. In Control. (Matthew 6:25-7, Job 41:11, Proverbs 16:4, Psalm 135:6) We saved the biggest one for last. It’s easy to believe all the preceding ones. I mean, who can argue with God being Merciful or Loving? We want to believe those things and it’s pretty obvious. But this one, the fact that God is sovereignly in control of all things and that nothing can happen without His permission creates existential panic and cautious semi-agreement in even the most staunch Christian during moments of calamity. If God is in control and nothing can happen without His permission then that means when I lost my job for no reason and had to go on unemployment, He allowed it. When you were raped, He could have stopped it, but didn’t. When you lost that child… spouse… He was in control. In the most simple answer: Yes. And you have to know that. Why it’s so hard is because in human terms we equate control with responsibility. So therefore he who was in control is also responsible. That is a logic fail. If you take twice the lethal dose of a drug, YOU are responsible for your death, not God. But, in His sovereignty, He allowed that course of events to move forward. And even more, He has promised that for His children, He will use those events for their good and His glory. But God… how can the death of my child be good??? How can this crushing defeat that sends my company – a company I dedicated to you – out of business be good? It sounds like a cop out to say this but it is the truth… I don’t know. But He does. Job asked this question and I love God’s answer (especially in the Message translation). God walked through all of the “natural” things of life – rain, wind, storms, animals, births, deaths, etc and then said “You don’t just think these things just happen, do you?”. No, they happen, the Bible is very very clear, at His command. Satan could only touch Job with God’s permission and subject to the limits He set. God withheld from Abraham the one thing he wanted most for a century. God allowed Joseph to suffer for over a decade in prison. All for a purpose He knew but they could not see. And never once did He give any indication that these things caught Him by surprise. To prove the contrary, the story of Esther, Ruth, David, Abraham, Moses, Paul, Peter and countless billions throughout time who have seen God take what we thought was the worst possible situation and not merely rescue them from it but in hindsight see clearly how God was setting and incredible timeline as He used it for their good. And for anyone who knows Romans 8:28 this shouldn’t come as a surprise but as a guarantee… God is using even this – whatever you are experiencing right now – for our good and His glory as we walk in faith with Him. Why? 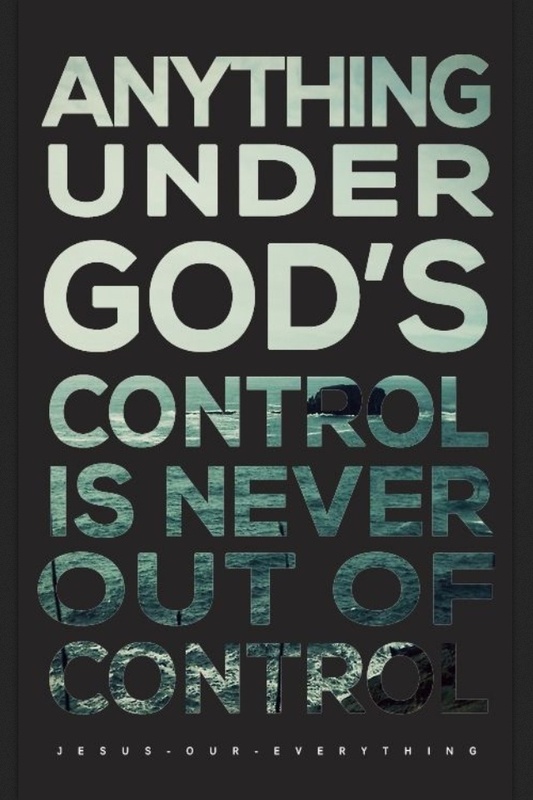 Because God is in control. Always. Thanks for taking time to walk with me through these truths today. Let me leave you with one last thought… what difference does knowing these things make? Well, let’s put it this way… if I took you into space and flew you all around the earth and showed you its curve and circumference would anyone ever be able to convince you that the earth is flat? Why? Because you KNOW that the earth is round. You are convinced of it. It’s no longer theory or belief… it’s settled fact. Are these truths of who God is settled fact in your life? Until they are, you will always have a battle between what you feel and what is. Always take the time to act on what is, not what you feel. God is merciful, loving, compassionate, perfect, gentle, almighty and in control. And nothing, praise God, will ever change that. And yeah, I wrote this on of the worst days in recent memory. Because, as Chambers said, if it doesn’t work in the trenches, it doesn’t work anywhere. Praise God it works… Because He is God! I’ve had a moment in time that for the life of me has had a hold even though I know that that is the pivotal moment in which God delivered me there has been a valley of weeping for two and a half years as well as the various taunts of people etc please pray for me as your post has really spoken to that place I needed filled in my heart God bless you!!! We will pray Rhonda. Blessings to you as you follow Him. The road is not always easy or as we would want it, but there is not one that has ever followed God who had cause later to regret His navigation skills!